A Dove Award is an accolade by the Gospel Music Association (GMA) of the United States to recognize outstanding achievement in the Christian music industry. The awards are presented annually. Formerly held in Nashville, Tennessee, the Dove Awards took place in Atlanta, Georgia during 2011 and 2012, but has since moved back to Nashville. The ceremonies feature live musical performances and are broadcast on TBN. The awards were established in 1969, and represent a variety of musical styles, including rock, pop, hip hop, country, and urban. The Dove Awards were originally conceptualized by Gospel singer and songwriter Bill Gaither, at a Gospel Music Association board meeting in 1968. The idea of the award being represented by a dove is credited to Gaither and design for the award itself is credited to gospel singer Les Beasley. The first GMA Dove Awards were held at the Peabody Hotel in Memphis, Tennessee in October 1969. In 1971, the awards moved to Nashville. The 3rd GMA Dove Awards of 1971 were deemed invalid due to apparent ballot stuffing by the southern gospel group the Blackwood Brothers, and that year is still not considered an official awards year by the Gospel Music Association. There were no awards held in 1979, due to a decision by the Gospel Music Association to move the awards from autumn to spring. Every ceremony since has been held in the spring. The first televised ceremony was the 15th GMA Dove Awards of 1984, which aired on the Christian Broadcasting Network. The awards were held in Nashville until 2011 before being presented at the Fox Theatre in Atlanta, Georgia in 2012. They returned to Nashville in 2013, and have been held at the Allen Arena on the campus of Lipscomb University since. Because of the large number of award categories (42 in 2012), and the desire to feature several performances by various artists, only the ones with the most popular interest are presented directly at the televised version of the award ceremony. Song of the Year is awarded to the songwriter and the publisher. Obviously prompted and informed by a Christian world view. Prior to the definition, the only qualified music was that sold in Christian Booksellers Association affiliated stores. 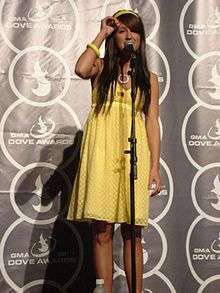 The new standards resulted in complaints by some fans and artists after thirteen entries were disqualified as being too secular in the 1999 Dove Awards. The rules were rescinded afterwards, and many groups disqualified by the rulings in 1999 were winners in 2000. ↑ Jones, Kim. "GMA Dove Awards History". About.com. Retrieved April 5, 2012. 1 2 Koonse, Emma (March 8, 2012). "Dove Awards 2012 Lineup Announced". The Christian Post. Retrieved April 5, 2012. ↑ Cusic, Don (2010). Encyclopedia of Contemporary Christian Music: Pop, Rock, and Worship. Santa Barbara, California: ABC-CLIO, LLC. pp. 111–113. Retrieved April 6, 2012. ↑ Landrum Jr., Jonathan (February 16, 2011). "Chris Tomlin, TobyMac lead Dove Award nominations". The Huffington Post. Retrieved April 6, 2012. ↑ "GOSPEL MUSIC ASSOCIATION ANNOUNCES RETURN OF THE LEGENDARY GMA DOVE AWARDS TO NASHVILLE". GMA Dove Awards. http://www.doveawards.com/: Gospel Music Association. March 19, 2013. Retrieved July 6, 2015. ↑ "NEWSBOYS, KARI JOBE AND LOVE & THE OUTCOME TO PERFORM ON 45TH ANNUAL GMA DOVE AWARDS" (PDF). GMA Dove Awards. http://www.doveawards.com/: Gospel Music Association. September 17, 2014. Retrieved July 6, 2015. ↑ "FAQs". GMA Dove Awards. http://www.doveawards.com/: Gospel Music Association. Retrieved July 6, 2015. ↑ "Nominees for the 43rd Annual GMA Dove Awards...". GMA Dove Awards. Retrieved April 2, 2012. ↑ Sterling, Christopher H. (2004). Encyclopedia of Radio. New York City: Taylor & Francis. p. 619. Retrieved April 6, 2012. ↑ Watkins, Terry. "GMA's "new" definition for Gospel music". Dial-the-Truth Ministries. Retrieved April 6, 2012. NOTE: The 1971 winners (except GMA Hall of Fame members) were nullified because of voting irregularities; no awards show was held in 1979, as the Gospel Music Association moved the awards show from September to April.